A plaque in memory of Zhang Shaolin, a Chinese tailor who died in August following an assault, was unveiled on Wednesday in Aubervilliers, in Seine-Saint-Denis, north of Paris. In August, 49-year-old tailor and grandfather Zhang Chaolin died in hospital after being attacked by three Africans. He had been walking in a quiet street of Aubervilliers. Zhang was reportedly kicked in the sternum and fell, striking his head on the pavement. The aim of the attack was allegedly to steal a small bag, but tailor had nothing on him except sweets and cigarettes. In response, on 4 September, at least 60 000 ethnic Chinese turned out in Paris’s Place de la Republique to give vent to their deep feelings of insecurity. Angry Chinese immigrants have demanded police protection from muggers who they say prey on them because they are seen as easy targets. 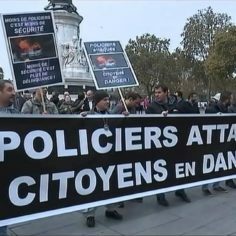 The Chinese community of Paris has held other protests in recent years over the attacks. 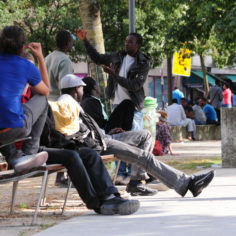 Mehdi Bouthegmès, an Arab councillor in La Courneuve, another Parisian suburb, has also observed the increase in aggression,: “In Bobigny, it starts to get organized, with a specific focus [on Asians]. This is not merely assaults on the street.” he said during an interview with France Inter. Leftists from MRAP, CRAN, LICRA, la Ligue des droits de l’homme or the CCIF (Collectif contre l’islamophobie en France) have all stood ready to go to court to protect the racial type of the assailants, however. But Troy remains unperturbed. Community workers confirmed that many muggings are committed by members of other minorities living in the area, generally of Arab or African origin. Many Chinese arrived along with North African immigration, often with less money. Some were even political refugees forced to flee for their lives. Today, they have taken root and their successes are exemplary. “France has opened the door to welcome us. We arrived poorer than other communities with, in addition, the language barrier. We escaped [our circumstances] through work, it’s the difference between us and them, ” said Jackie Troy. By “them” he means Africans. Activists say at least 100 attacks against Chinese nationals were reported in the suburb in just the first seven months of this year. 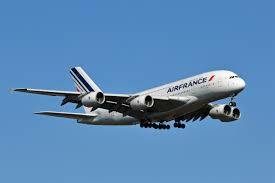 France does not keep statistics based on ethnicity, so it is difficult to know the real number of incidents. Parisian officials corroborated the number of attacks, but declined to identify the criminals by ethnic origin. Meriem Derkaoui, the suburb’s communist mayor, condemned Zhang’s murder as “racist targeting”. Community groups say such attacks are driven by a perception that Chinese people are weak, will not fight back and carry oodles of cash. Derkaoui pledged to expand video surveillance. The murder of the tailor after being savagely beaten, has lent new urgency to the long running complaint that Asian immigrants are systematically attacked and robbed in the French capital. “The Chinese community is dying in silence,” read a slogan on a T-shirt worn by one demonstrator, Maike Song. Song’s shirt, was splashed with red, to symbolise bloodstains. He told AFP that he had joined the protest in Aubervilliers to pay homage to Chaoling Zhang, assaulted in the north-eastern suburb that is home to some 4 000 Chinese immigrants. A working-class and immigrant-heavy area, also home to more than 1 200 mostly Chinese wholesalers, Aubervilliers is an important European textile centre. Buyers come from far and wide to purchase well-priced goods. Many Chinese immigrants own restaurants or shops and tend to be relatively well-off, but are often reluctant to go to the police, also because they are illegal immigrants, according to a social worker. 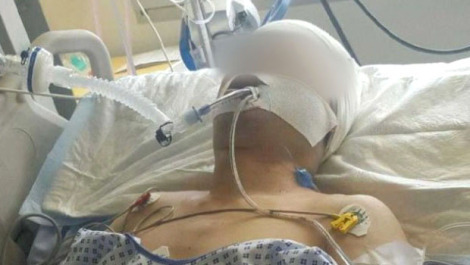 Zhang’s attackers shouted racist slurs while savagely beat him. Six years ago, people of Chinese origin similarly protested racial violence aimed at them in Paris’s Belleville neighborhood, in the 10th Arrondisement, an area with a large Chinese community. “In 2010, there were lots of thefts and beatings,” said Frédéric Zhou, Zhang’s former landlord, who recounted his own instances of verbal abuse and physical threats to the New York Times. “We protested, and the authorities said they would try to stop these attacks. But in six years, it’s gotten worse, and now there’s a death. While conditions in Belleville have improved, violence against people of Asian descent in some other areas appears to have increased. Joelle Huy, the president of the owners’ cooperative of La Résidence du Parc, a majority Chinese housing complex in La Courneuve, a suburb adjacent to Aubervilliers, described an attack on the night of July 13 to Times. During the first seven months of 2016, some 105 violent thefts targeting Aubervilliers’s Chinese residents were registred. They are a small group of some thousands in a town of 77 000 inhabitants. The reported assaults are most likely only a fraction of the actual total, because many in the community feel it is useless to go to the police. In September, the court in Bobigny sentenced three young Africans implicated in the violent mugging of a Chinese family and, for the first time, recognized the crime’s racially motivated character as an “aggravating circumstance”. The Aubervilliers Police Department has hired a part-time translator to assist with the filing of complaints on a biweekly basis in an effort to improve relations with residents of Chinese origin. Still, some, including the CGT Police Ile-de-France — the Paris region’s branch of the national police union — say more officers won’t solve the problem. “We need a police force that is closer to the local population, one that can anticipate problems in the community,” Axel Ronde, the group’s general secretary, said.